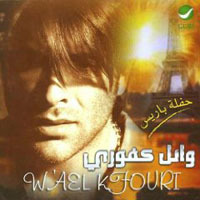 This page contains a translation into English of the lyrics to the Arabic song "Arraib Layyi", which was sung by Wael Kfouri. Also included is a transliteration of the Arabic lyrics into the Roman alphabet so you can sing along if you like. Other ways this song title might be spelled are "Arrab Leeya" or "Arraib Layya". Ya habeebi arraib layyi tadhommak fi eidayyi. O my darling get close to me so I can embrace you with my hands. Intai ibta3raif ana sho ibhibak iw adaish ghaali 3alayyi. You know how much I love you and how precious you are to me. Habeebi khaleek haddi. My darling stay beside me. Ghair 3yonak ma baddi. I want nothing but your eyes. Ibkhaf la wahdi ib2a lawahdi laou bitgheeb ishwayai. I fear loneliness. I don't want to be left alone if you go away for a while. Sho ibhibak lamma ibtihki, tirsom 3a shfafak ildhihkai. I love you so much when you talk, draw a smile on your lips. Sho ibhibak lamma ibtibki, ibtishki iw 3am itghalghail fiyyi. I love you so much when you cry, complain and get through me. Habeebi inta ilahla, 3omri ib2orbak 3am yihla, 3otrak, sihrak, sawtak, rasmak saaro minni iw fiyyi My darling you are beautiful, my life becomes more beautiful when I am near you. Your perfume, magic, voice and drawing became part of me. Ya habeeb albi tammini innak ma ibtib3od 3anni. Oh my heart lover, assure me that you will not be far away from me. Inta hobbi iw ra3shait albi iw inta noor 3inayyi. You are my love, the thrill in my heart, and the sparkle in my eye. Ya habeebi inta ilghaali, inta amar illayaali, dhal ibbaali iw rayah baali. Wighmorni ib hiniyai. Oh my darling, you are precious, you are the moon in the night. Stay in front of me and make me feel at ease and cover me with tenderness. Habeebi inta ilahla, 3omri ib2orbak 3am yihla, 3otrak, sihrak, sawtak, rasmak saaro minni iw fiyyi My darling you are beautiful, my life near you is becoming more beautiful. Your perfume, magic, voice and drawing became part of me. Ya habeebi arraib layya. O my darlling, get close to me. Sho obhibak, aah. I love you so much, aah.